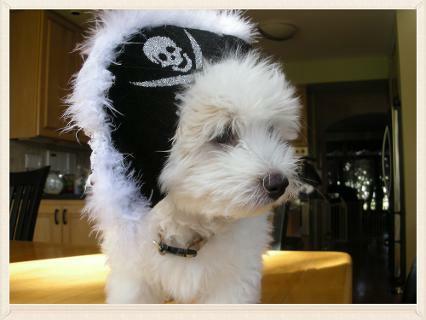 The history of the dog known as the Coton de Tulear is romantic and exotic, but unfortunately very poorly documented. There are stories of pirates and shipwrecks, and the most common story passed about is that cotons are the descendants of dogs who survived a shipwreck near the coast of the island of Madagascar. Madagascar is the world's fourth largest island, and lies in the Indian Ocean off the east coast of Africa. These dogs who purportedly survived the shipwreck and swam to shore were believed to have bred with local feral dogs and also with other bichon breeds such as the Maltese, to create what has become known as the Coton de Tulear. "Coton" is French for "cotton" and "Tulear" is the name of a port city in the southern portion of the island, now known as Toliara. During the 17th Century, the Merina, the ruling tribal monarchy of Madagascar, became enamored with the little white dogs roaming the island and started to closely control the breed. It became illegal for those who were not in the nobility to own a coton and the dog developed the moniker "The Royal Dog of Madagascar". 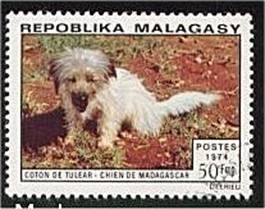 The Coton de Tulear was honored on a Madagascar postage stamp in 1974. Later, French colonists got involved, and dogs eventually were exported to France, where the breed was further developed. Political and economic crises in Madagascar that have occurred over the years have threatened the dog with extinction in its native land. Strict controls were eventually put in place to limit exports of the breed from the island. Cotons first arrived in the United States directly from Madagascar in 1974. The dogs that were originally exported by the French colonists made their way across Europe and many of those lines eventually made their way to the United States as well. The dogs have been enthusiastically received, and are rapidly becoming one of the fastest growing rare breeds in America and Europe. They are best known for their soft, cottony coat, their beautiful dark eyes, and their sweet temperament and playful personalities. I have often heard them referred to as the "anti-depressant dog." It is truly hard to feel blue when your are in the company of one of these little angels! There are several different breeds standards for the Coton de Tulear. 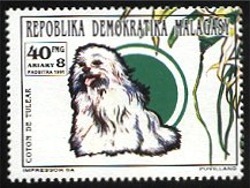 Among them are the mCTCA Standard, which applies to those dogs registered with the mCTCA (Malagasy Coton de Tulear Club of America, from lines primarily originating in Madagascar), the FCI Standard (Federcion Cynologique International, used by the United Kennel Club, the American Rare Breed Association and several other venues, and also by European breeders), and most recently the AKC Standard, which is used by the American Kennel Club in the United States. All of them call for a small, sturdy, happy, healthy, intelligent companion dog, which, if properly bred, they certainly are!